Alet oversees strategic Business Development and Marketing actions to bring Soteria to market and to align with bespoke client requirements and needs. She plans and executes on strategic proof or concepts to advance the technical and practical capabilities of Soteria to address market needs and demonstrate benefits to clinical and C-suite stakeholders. 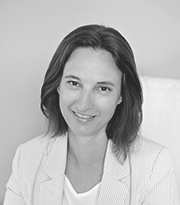 She is responsible for researching, preparing and executing bespoke clinical case studies to support strategic business opportunities for the purpose of demonstrating the value proposition that Soteria brings to various clinical domains. She oversees all marketing and trade show actions, execution and preparations within all international market segments. She contributed during the initial design of Soteria as a front end Mobile iOS Designer. She holds a BA FA in Graphic Design.